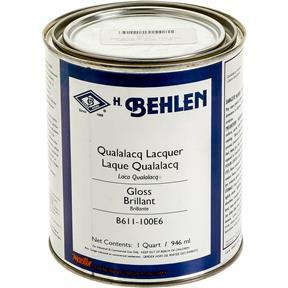 Qualalacq Alcohol Resistant Lacquer - Gloss, 1 qt. 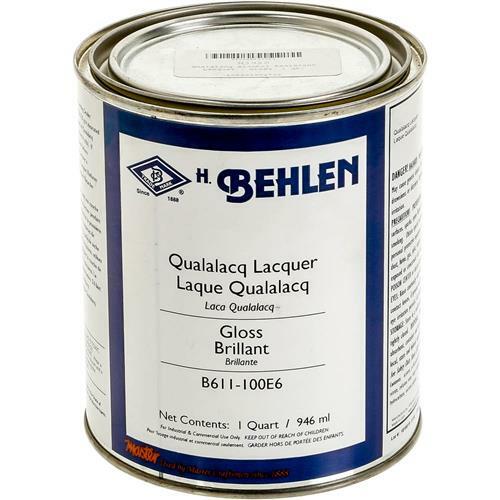 Behlen B611-100E6 - Qualalacq Alcohol Resistant Lacquer - Gloss, 1 qt. Due to restrictions on certain paints and industrial coatings, this item cannot ship to the following states: California, Colorado, Connecticut, Maine, Minnesota, Oregon, Rhode Island, Vermont, and Washington DC. This is the top-of-the-line clear lacquer. Highly resistant to the strongest alcohols, water, moderate heat and impacts and scratches after a week of cure time. Nitrocellulose based, this lacquer is the hardest of the hard and will take punishment that would normally ruin other lacquers. May be used on table tops and other applications which require a super finish for the hardest use. Qualalacq Sanding Sealer and Qualalacq thinner are recommended in conjunction with this product. Please note that this is a spray-only product.